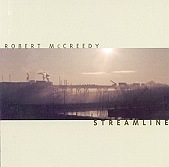 Rootsy, folk-inspired alt-country-pop songs, Robert McCreedy's songwriting credentials shine on Steamline, a beautiful, well put together collection of heartening, honest songs as alive as the day, and as windy as the night. From McCreedy's ability to craft down home melodies to his smooth, oft low key singing style, McCreedy comes across as your long time friend, singing in front of a campfire, telling tales of heartache and loss with a warm spin. I'll give this a B+.